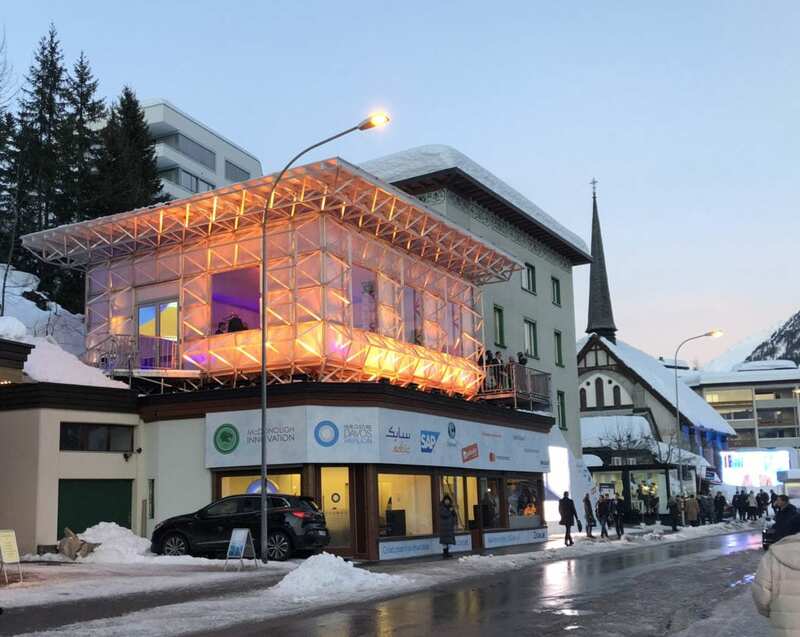 Designer and thought leader William McDonough is exhibiting Cradle to Cradle Design™ at the ICEhouse™ (Innovation for the Circular Economy house) in Davos, Switzerland this week. This year marks the fourth year serving as a meeting space for the World Economic Forum (WEF) and its fifth assembly and disassembly. The ICEhouse demonstrates key concepts of McDonough’s work and Circular Economy thinking including Design for Disassembly and Products As A Service. 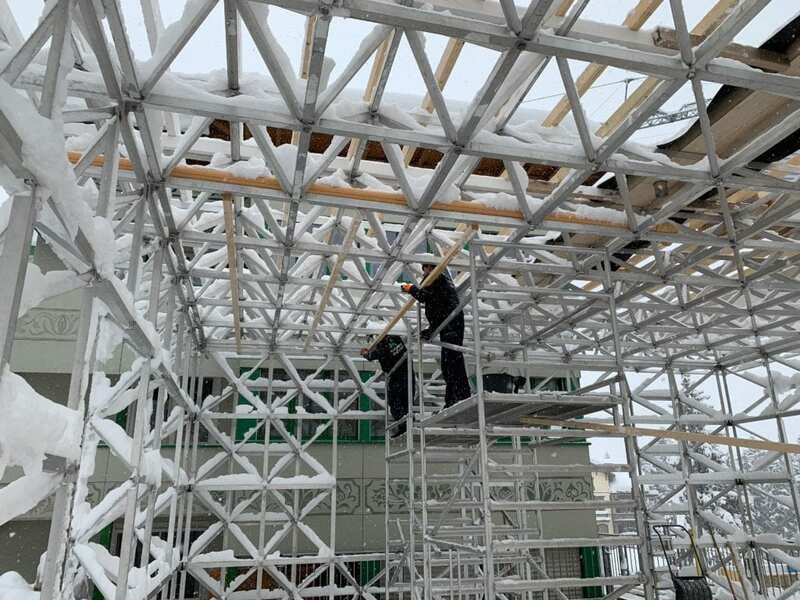 Specifically, the creation of the ICEhouse’s WonderFrame™ structure was designed to be constructed using simple tools to allow quick assembly and disassembly without waste. Conceived for Hub Culture, the structure has been assembled for the one week of gatherings and will be disassembled again and stored in a container until the next construction. The ICEhouse structure itself, which is primarily composed of aluminum, polymer, aerogel and carpet tiles, is made of technical nutrients which are either Cradle to Cradle Certified™ or currently in the midst of the certification process. ICEhouse sponsor SABIC provides their LEXAN™ sheets and systems for the walls and roof. At the end of the materials’ use they can be returned to industry and endlessly remanufactured in the Circular Economy with no loss in quality. The ICEhouse also features the first Cradle to Cradle Certified™ carpet tiles from Shaw, a Berkshire Hathaway company. This year, the team utilized Shaw’s used carpet reclamation program, ‘We Want it Back,’ by returning the previously used carpet tiles to be separated and recycled for future reuse. The ICEhouse is now carpeted with a design from the A Walk in The Garden collection, a collaboration between Shaw and McDonough inspired by his experience in China. This endeavor kicks off an important year for the Shaw and McDonough collaboration — the 20-year anniversary of working together to embrace Cradle to Cradle Design. McDonough has been active in sustainability discussions at WEF for nearly two decades including serving as inaugural Chair of the Forum’s Meta-Council on the Circular Economy (2014-2016). He is currently a member of the WEF’s Global Future Council on Environment and Natural Resource Security. This year conversations taking place in the ICEhouse and led by McDonough will include circularity including solutions for the global terrestrial and maritime plastic pollution crisis. The ICEhouse is the result of close collaboration between McDonough, Hub Culture, SABIC and McDonough Innovation. The ICEhouse was designed by William McDonough + Partners and built by WonderFrame, LLC.